Don’t miss the fourth free BIXI Sunday event of the season sponsored by Manulife on August 26! Montreal is home to many works of urban art like sculptures, art installations and murals. Every time you ride a BIXI, you can see the impressive work of artists here and there along the way. August 26 is a great day to head out to explore urban artwork in Montreal because all trips of 30 minutes and less will be free! 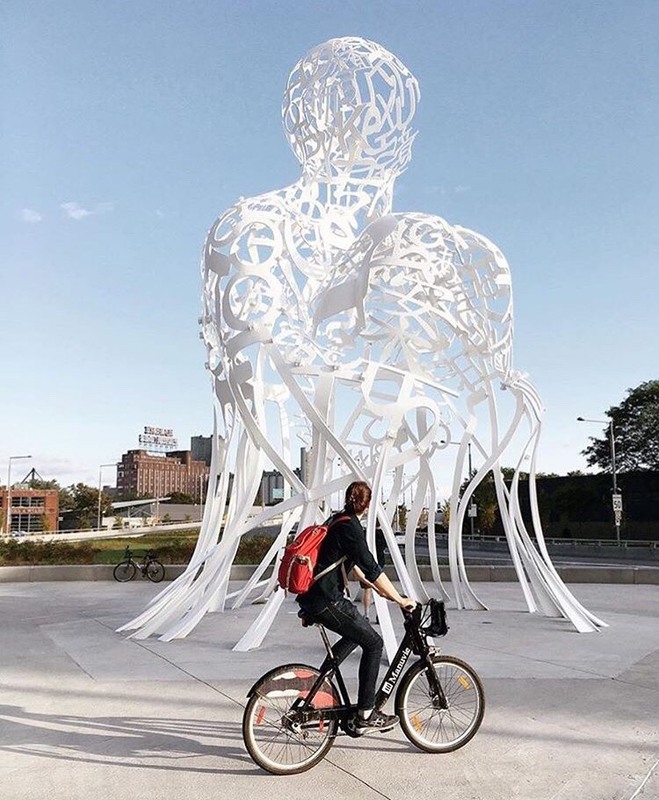 This imposing work by Jaume Plensa is made from white letters and was installed in 2017 as part of Montreal’s 375th anniversary. Well-known artists from here and elsewhere decorate the city’s walls every summer, much to our delight. Explore our 2018 favourites here. This magnificent work by Jean-Robert Drouillard has been featured at the Pie-IX-Sherbrooke intersection since last year. This work has become favourite in the city. It features a man who is just as essential to our cultural landscape. This mural by artists El Mac and Gene Pendon is located at the corner of Saint Catherine and Crescent Streets. British artist Raymond Mason created this vibrant work in the heart of downtown. The sculpture is located at the Esplanade du 1981 on McGill College Avenue. 2. Insert your credit card, select “One Way $0,” then follow the instructions on the screen. *A $20 deposit will be held for up to 10 days per bike. 3. Enter the code you get after completing the transaction on the keyboard located to the left of the bike dock for the BIXI you’ve chosen. 4. Head out to explore Montreal for 30 minutes max. Fees will apply if you spend more than the allocated time. 5. Return your BIXI to any station and start another trip as many times as you want. Free BIXI Sundays are sponsored by Manulife in collaboration with La Presse+ and our health partner Rachelle-Béry. Free snack bags for participants are compliments of Rachelle-Béry. Keep an eye out for the BIXI Manulife Valets this Sunday to get one!